$1250 For Full Day Offshore - Target Species: Blue and White Marlin, Dolphin(mahi), Tuna, Wahoo, Sailfish, King Mackeral, Tile Fish, Triggerfish, Grouper, Snapper, Sharks and more. All Charters include the Bait, Tackle, Fishing Licenses and Ice for the day. The only you would need to bring food, drinks, sunscreen and sunglasses. We usually leave the dock around 6am and get back around 4-5pm depending on the time of year and where we fish that particular day. $1050 3/4 Day Nearshore- Target Species: Cobia, Amberjack, Sea Bass, King Mackeral, Triggerfish and/or Sharks - In the late Spring the 3/4 day trips are for Cobia. 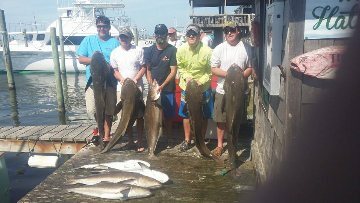 Cobia trips we need the sun to get up to be able to spot the fish so we typically leave the dock around 7:30-8 returning around 4-5pm. 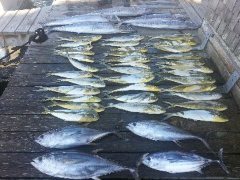 In the summer months we run 3/4 day wreckfishing trips for Amberjack, Sea Bass, Triggerfish, King Mackeral and more. These trips we even catch a few Mahi from time to time depending on the conditions. 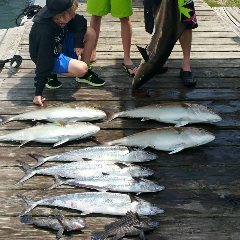 $625 Half Day Inshore- Target Species: Spanish Makeral, Cobia, Bluefish, King Mackeral, Amberjacks, and/or Sharks. Half days can be spent in or around the inlet or we can venture out 5-8 miles to some nearshore bottom that holds fish in the summer months. We can do either morning or afternoon half days. Mornings are 6:30-11:00 afternoons are 12:00-4:30. We are working to get our online booking calender up and running. Until then please give us a call or shoot us an email to plan your Hatteras Charter Fishing trip of a lifetime.